Jonatan Christie added to his winning record against world #2 Shi Yuqi in a surprisingly short appearance on Court 1. 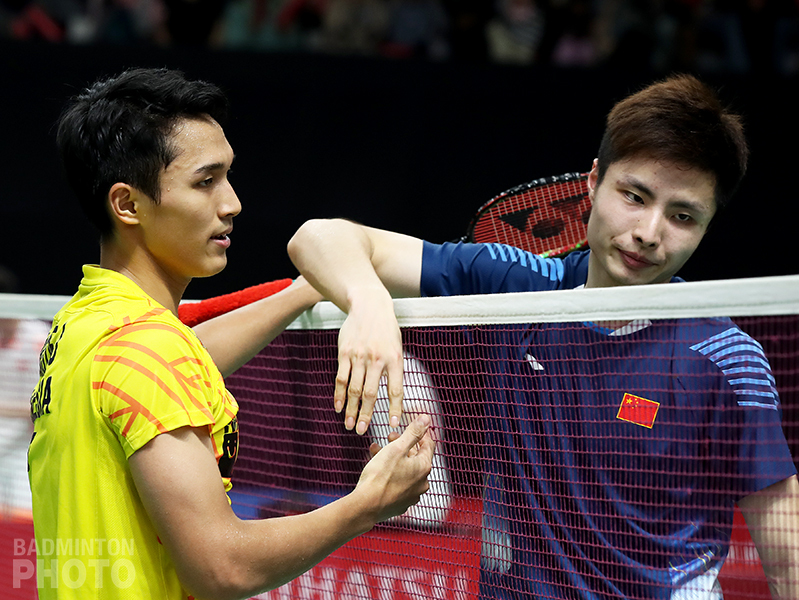 The last time Jonatan Christie faced China’s Shi Yuqi was also in Jakarta, in the opening match for each of them at the 2018 Asian Games. On that occasion Shi, All England champion, already ranked #2 in the world and coming off a runner-up finish at the World Championships, went down in three tough games, starting off the Indonesian’s dream run that would end with the gold. This time, there was again a tight score in the first game of the game between the second seed and the Asian Games gold medallist, who is still just knocking on the door of the world’s top ten. Playing a bit nervously in the opener, Christie was close to losing when he trailed 17-20. 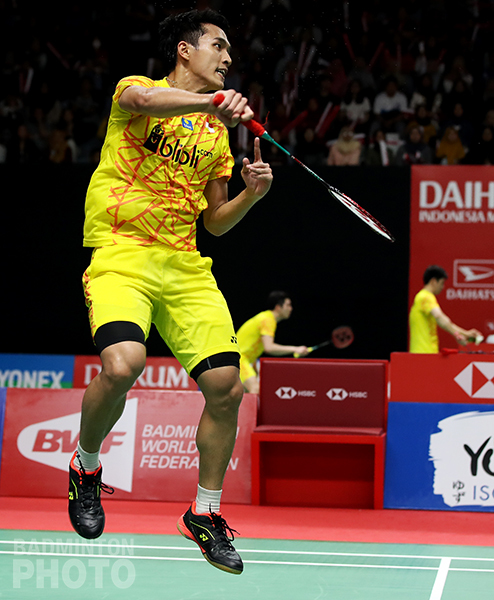 The Indonesian then brought out his best performance and tried to reach every single point without worrying about the result of the match. This worked for him as he pulled out the first game in 22-20. 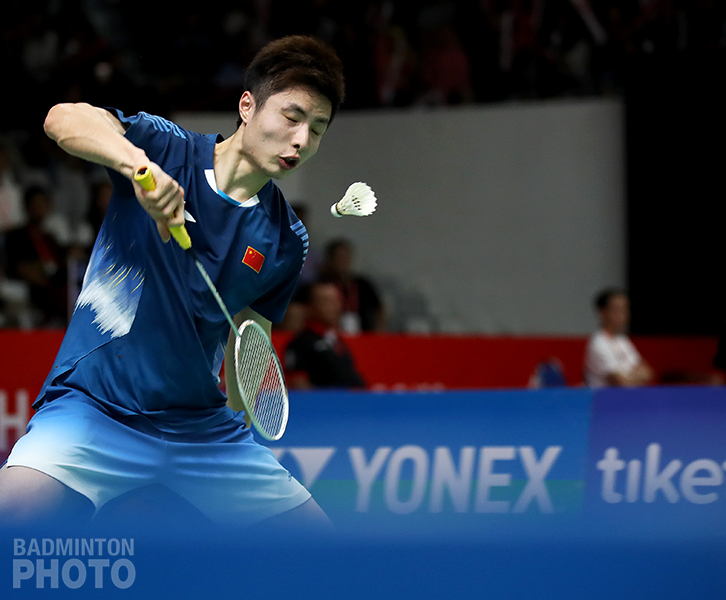 The 21-year-old did not expect to win the match in straight games since his last five matches against Shi had always gone to a rubber game, but the match soon ended 21-6 in the home shuttler’s favour, faster than he expected. “I was fine with the atmosphere in the match. The euphoria in the Asian Games was even so much noisier than this competition, so it was not a problem,” Shi Yuqi (pictured) explained regarding home supporters whose shouting was of course overwhelmingly backing his opponent. Shi Yuqi added that his loss was not because of his physical condition. Although he had a stomach ache during the Malaysia Masters, now he is fine. Still, the world #2 plans to evaluate his match from this week and be more prepared toward any opponents to show his best performance. 21-year-old Pornpawee Chochuwong (pictured right) of Thailand made her own surprise by overthrowing former women’s singles world #1 Akane Yamaguchi in the second round of Indonesia Masters. The first game was tight for both players until the position of 19-18. Unfortunately for Yamaguchi, now ranked #6, lost focus and was forced to cede the first game 18-21. Yamaguchi was unable to get out from under the pressure which made her make unforced errors and Chochuwong took the second game 21-12. “In the first game I was leading but was successfully chased by the opponent. After that defeat, I felt down so I couldn’t concentrate during the second game,” Yamaguchi said. At the Malaysia Masters a week earlier, the Japanese star also suffered an early round upset, losing to lower-ranked host player Goh Jin Wei. She feels that there have been many changes that have influenced her game lately: “I feel my game has changed a lot,” Yamaguchi said. “Lately, when competing in a disadvantaged position, I feel mentally broken. Usually I can still focus and be resilient even though I am in a lagging position. At this moment, it is somehow difficult to get out of the pressure if I am behind in the score. “Maybe this is happened because of the ranking I achieved last year. In the future, I will try to improve my mental strength so that I can come back with my best performance,” Yamaguchi promised. With this result, Japan found itself with no representatives in the women’s singles quarter-finals. Pornpawee Chochuwong, meanwhile, will face India’s Saina Nehwal, who disappointed local fans by seeing off Thailand Masters champion Fitriani in straight games.